It’s tax time in my neck of the woods and that means keeping sweet with the tax man. That’s easy enough to do if you’re getting a pay cheque from your employer because they handle all your tax payments. Generally speaking, you never see any of that money, it goes straight to the tax man. 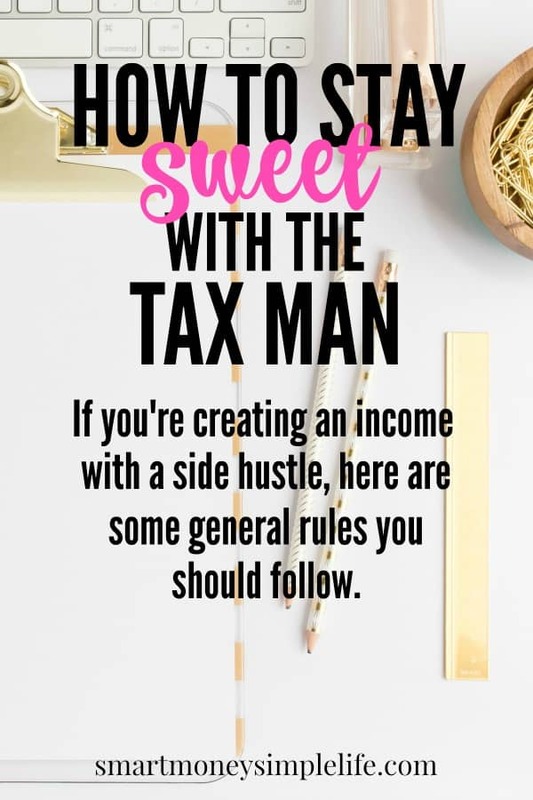 If you have side hustles bringing in an income, tax is something you’re responsible for. You might think if you’re just making a few bucks here and there by selling on eBay or renting out your spare room on Airbnb, you don’t need to declare that income to the tax man. You do. So, don’t risk it. Declare it. Tax departments everywhere employ very sophisticated data matching technology, so they know who’s been selling on eBay or Airbnb or Uber or Etsy (like me)… You get the idea. Don’t think you can hide that money. You can’t. If you’re creating an income with a side hustle, here are some general rules you should follow. Regardless of the size of your side hustle earnings, always, always, always declare the income on your tax return. That means you need to track your income as it comes in – a spreadsheet or notebook will do – and keep copies of payment invoices. If you under-report your earnings, there’s a very good chance the tax man will find out and when he does, you’ll be hit with a big bill for back taxes, fines, penalties and interest. If your personal income tax rate is 30%, put that percentage of your side hustle income into a separate savings account. As soon as you receive the income. Leave your shopping spree until after all your responsibilities have been covered. You might not need it all for your tax bill but it’s better to err on the side of caution and know that you have plenty to cover any tax liabilities you incur through your side hustle. Regardless of the side hustle, you’ll have expenses. Stock and packaging materials if you sell on eBay or Etsy. New towels for your Airbnb room. Even if you’re not sure you can claim them against your side hustle income, keep your receipts. You definitely can’t claim expenses you can’t prove. There are always expenses you can claim against your side hustle income. Know what they are and make sure you claim them. It’s worth getting some professional advice so you know all the claims available to you, as well as any longer term liabilities. For example, if you rent out your spare room you can claim depreciation on that portion of your house while it was rented. However, that can also impact your capital gains tax obligations when you eventually sell the house. Make sure you’re aware of all the benefits and implications. It makes good sense to create additional income streams by starting a side hustle. Be business-like about it and make sure you know what your obligations are (tax and regulatory) and what business expenses you can legally claim against your side hustle income. Ignorance is no excuse so if you’re not sure, see an accountant or tax agent and do your research. A side hustle should help you pursue your dreams, not create a tax nightmare.